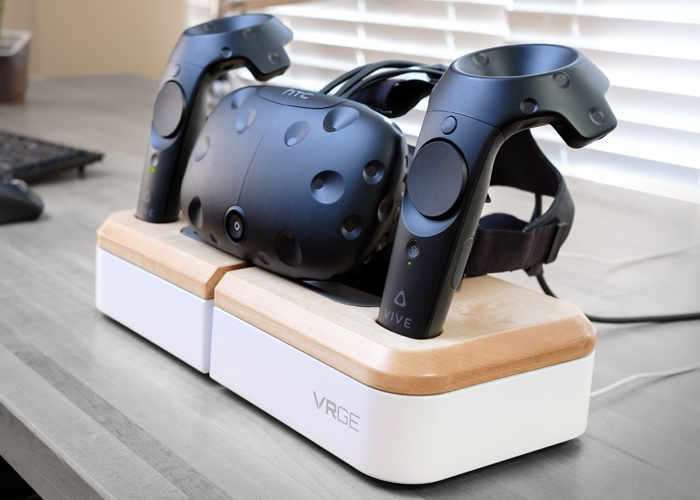 Those of you lucky enough to already own virtual reality hardware such as the PlayStation VR, HTC Vive or Oculus Rift, may be interested in a new virtual reality hardware charging station called the VRGE. The VR charging dock has been specifically designed to help you organise and charge multiple virtual reality systems and can either be positioned on your desktop all mounted to a wall depending on your preference. Watch the video below to learn more about the VRGE and the inspiration behind it. VRGE has this week launched via Kickstarter and is now available to back with pledges starting from just $59 for earlybird backers, with shipping expected to take place during April 2017. To us, Virtual Reality (VR) is tangible imagination. It is being utilized to excite, educate, entertain, and express new ideas. We are excited about the future of VR and want to be part of the revolution. This technology has the potential to inspire people, cultures and communities in a way the world has never experienced. We are not just VR fans; we are users! Our goal with VRGE is to create thoughtful products for this new digital frontier. We set out to create the first and most versatile virtual reality storage system – a powered dock that would organize, charge and protect current and future VR hardware. With the VRGE VR dock, headsets can be oriented down to protect sensitive lenses from light and dust. No tension is placed on fabric, foam or elastic components, maintaining longevity of your VR investment. The VRGE VR dock has a center cavity optimized for all headset/visors sizes. This opening, plus internal retaining features, secure each headset yet still provide easy accessibility. The VRGE VR dock also provides flexibility for storing headphones in both wall-mount or desktop configurations. Contact surfaces (center bumper and accessory adapters) are made from soft touch materials to prevent scratching or marring of exterior hardware finishes. Additionally, non-skid feet prevent sliding and protect tables and desktops.